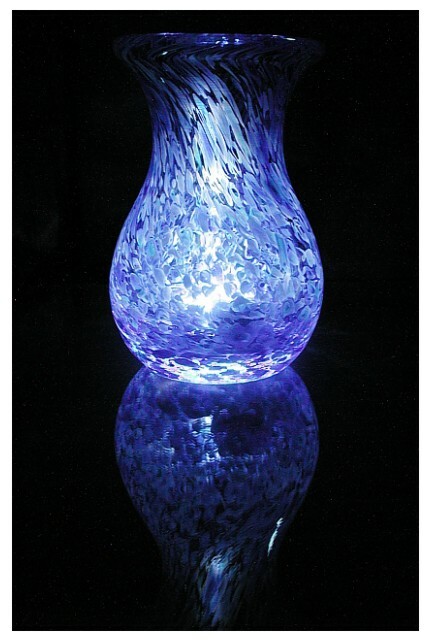 Blue vase on glass with an LED light inside. I tried all kinds of lighting from above and below which didn't work. The LED light finally achieved the effect I was looking for which was to illuminate the vase until it reflected in the glass below it. Nice idea, to put the light inside the vase. Cool. It would be even better if you step back a little to include the whole reflection~ well done! this is so pretty! Nice work! Nice image. I like the reflections and the color. It gives a very nice effect. Good job. Low key light make the dark background grainy. However the lighting for the vast itself is very nice. Proudly hosted by Sargasso Networks. Current Server Time: 04/24/2019 11:49:45 AM EDT.